Copyrighted by Nature Study Pub. Co., 1897, Chicago. T has been observed that when the Turkey makes its appearance on table all conversation should for the moment be suspended. That it is eaten in silence on some occasions may be inferred from the following anecdote: A certain judge of Avignon, famous for his love of the glorious bird, which the American people have wisely selected for the celebration of Thanksgiving Day, said to a friend: “We have just been dining on a superb Turkey. It was excellent. Stuffed with truffles to the very throat—tender, delicate, filled with perfume! We left nothing but the bones!” “How many were there of you?” asked his friend. “Two,” replied the judge, “the Turkey—and myself!” The reason, no doubt, why this brilliant bird, which so much resembles the domestic Turkey, is now almost extinct. It was formerly a resident of New England, and is still found to some extent as far north-west as the Missouri River and south-west as Texas. In Ohio it was formerly an abundant resident. Dr. Kirtland (1850) mentions the time when Wild Turkeys were more common than tame ones are now. The nests of this bird are very difficult to discover, as they are made on the ground, midst tall, thick weeds or tangled briars. The female will not leave the nest until almost trodden upon. It is stated that when the eggs are once touched, she will abandon her nest. The Turkey became known to Europeans almost immediately upon the discovery of America by the Spaniards in 1518, and it is probable that it is distinctively an American bird. In its wild state, its plumage, as in the case of the Honduras Turkey, grows more lustrous and magnificent as the family extends southward. The “Gobblers,” as the males are called, associate in parties of ten to one hundred, seeking their food apart from the females, which wander singly with their young or in troops with other hens and their families, sometimes to the number of seventy or eighty. They travel on foot, unless disturbed by the hunter or a river compels them to take wing. It is said that when about to cross a river, they select a high eminence from which to start, that their flight may be more sure, and in such a position they sometimes remain for a day or more, as if in consultation. On such occasions the males gobble vociferously, strutting about pompously as if to animate their companions. At the signal note of their leader, they wing their way to the opposite shore. The Wild Turkey feeds on many kinds of berries, fruits, and grasses. Beetles, tadpoles, young frogs, and lizards are sometimes found in its crop. When the Turkeys reach their destination, they disperse in flocks, devouring the mast as they proceed. Pairing time begins in March. The sexes roost apart, but at no great distance, so that when the female utters a call, every male within hearing responds, rolling note after note in rapid succession, in a voice resembling that of the tame Turkey when he hears any unusual noise. Where the Turkeys are numerous, the woods from one end to the other, sometimes for many miles, resound with these voices of wooing. The specimen of the Wild Turkey presented in this number of Birds is of extraordinary size and beauty, and has been much admired. The day is not far distant when a living specimen of this noble bird will be sought for in vain in the United States. Range—Eastern United States from Pennsylvania southward to Florida, west to Wisconsin, the Indian Territory and Texas. Nest—On the ground, at the base of a bush or tree. Eggs—Ten to fourteen, pale cream buff, finely and evenly speckled with grayish brown. The Wild Turkey (Meleagris gallopavo) is native to North America and is the heaviest member of the diverse Galliformes and are in the Phasianidae – Pheasants, Fowl & Allies Family. It is the same species as the domestic turkey, which was originally derived from a southern Mexican subspecies of Wild Turkey (not the related Ocellated Turkey). 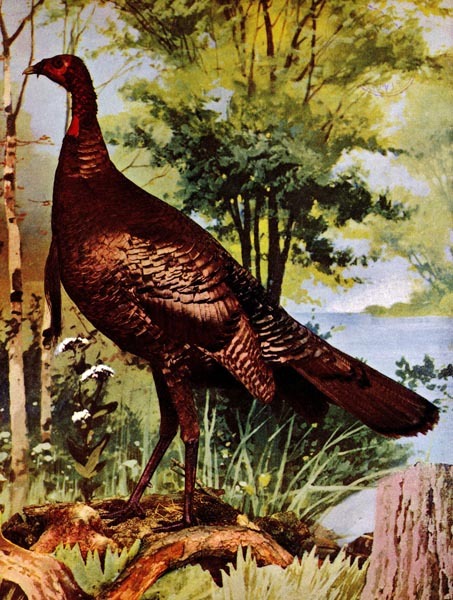 Although native to North America, the Wild Turkey got its name due to the trade routes in place. During the 16th Century, the major trade route from the Americas and Asia required the goods to go to Constantinople in Turkey before being sent to Britain. The British at the time therefore, associated the Wild Turkey with the country Turkey and the name stuck. Adult wild turkeys have long reddish-yellow to grayish-green legs. The body feathers are generally blackish and dark brown overall with a coppery sheen that becomes more complex in adult males. Adult males, called toms or gobblers, have a large, featherless, reddish head, red throat, and red wattles on the throat and neck. The head has fleshy growths called caruncles. Juvenile males are called jakes, the difference between an adult male and a juvenile is that the jake has a very short beard and his tail fan has longer feathers in the middle. The adult male’s tail fan will be all the same length. When males are excited, a fleshy flap on the bill expands, and this, the wattles and the bare skin of the head and neck all become engorged with blood, almost concealing the eyes and bill. The long fleshy object over a male’s beak is called a snood. When a male turkey is excited, its head turns blue; when ready to fight, it turns red. Each foot has three toes in front, with a shorter, rear-facing toe in back; males have a spur behind each of their lower legs. 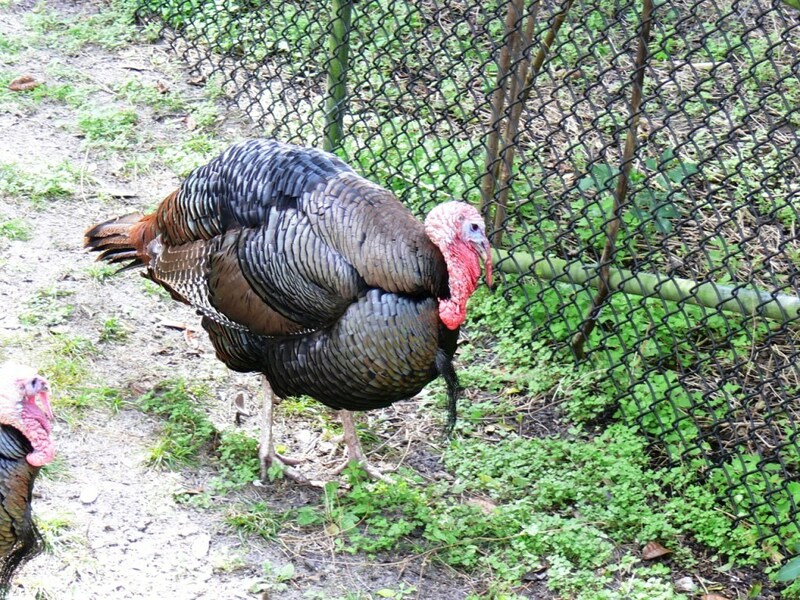 Male turkeys have a long, dark, fan-shaped tail and glossy bronze wings. The male is substantially larger than the female, and his feathers have areas of red, purple, green, copper, bronze, and gold iridescence. Females, called hens, have feathers that are duller overall, in shades of brown and gray. The primary wing feathers have white bars. Turkeys have 5000 to 6000 feathers. Tail feathers are of the same length in adults, different lengths in juveniles. Males typically have a “beard”, a tuft of coarse hair (modified feathers) growing from the center of the breast. Beards average 230 mm (9.1 in) in length. In some populations, females have a beard, usually shorter and thinner than that of the male. The adult male (or “tom”) normally weighs from 5 to 11 kg (11 to 24 lb) and measures 100–125 cm (39–49 in) in length. The adult female (or “hen”) is typically much smaller at 2.5–5.4 kg (5.5–12 lb) and is 76 to 95 cm (30 to 37 in) long. The wings are relatively small, as is typical of the galliform order, and the wingspan ranges from 1.25 to 1.44 m (4 ft 1 in to 4 ft 9 in). The bill is also relatively small. The tarsus of the Wild Turkey is quite long and sturdy. The tail is also relatively long The record-sized adult male Wild Turkey, … weighed 16.85 kg (37.1 lb). While it is usually rather lighter than the waterfowl, after the Trumpeter Swan, the turkey has the second heaviest maximum weight of any North American bird. Going on average mass, several other birds on the continent, including the American White Pelican and the very rare California Condor and Whooping Crane surpass the mean weight of turkeys. Turkeys have many vocalizations: “gobbles,” “clucks,” “putts,” “purrs,” “yelps,” “cutts,” “whines,” “cackles,” and “kee-kees.” In early spring, male turkeys, also called gobblers or toms, gobble to announce their presence to females and competing males. The gobble can carry for up to a mile. Males also emit a low-pitched “drumming” sound; produced by the movement of air in the air sack in the chest, similar to the booming of a prairie chicken. In addition they produce a sound known as the “spit” which is a sharp expulsion of air from this air sack. Hens “yelp” to let gobblers know their location. Gobblers often yelp in the manner of females, and hens can gobble, though they rarely do so. Immature males, called jakes, often yelp. Alarm Call by several birds. Wild turkeys prefer hardwood and mixed conifer-hardwood forests with scattered openings such as pastures, fields, orchards and seasonal marshes. Open, mature forest with a variety of interspersion of tree species appear to be preferred. In the Northeast of North America, turkeys are most profuse in hardwood timber of oak-hickory and forests of red oak, beech, cherry and white ash. Best ranges for turkeys in the Coastal Plain and Piedmont sections have an interspersion of clearings, farms, and plantations with preferred habitat along principal rivers and in cypress and tupelo swamps. Appalachian and Cumberland plateaus, birds occupy mixed forest of oaks and pines on southern and western slopes, also hickory with diverse understories. Bald cypress and sweet gum swamps of s. Florida; also hardwood of Cliftonia in north-central Florida. Lykes Fisheating Creek area of s. Florida has hardwood hammocks, glades of short grasses with isolated live oak; nesting in neighboring prairies. Original habitat here was mainly longleaf pine with turkey oak and slash pine “flatwoods,” now mainly replaced by slash pine plantations. Wild turkeys are omnivorous, foraging on the ground or climbing shrubs and small trees to feed. They prefer eating hard mast such as acorns, nuts, and various trees, including hazel, chestnut, hickory, and pinyon pine as well as various seeds, berries such as juniper and bearberry, roots and insects. Turkeys also occasionally consume amphibians and small reptiles such as lizards and snakes. Poults have been observed eating insects, berries, and seeds. Wild turkeys often feed in cow pastures, sometimes visit back yard bird feeders, and favor croplands after harvest to scavenge seed on the ground. Turkeys are also known to eat a wide variety of grasses. This was taken on the Roaring Fork Drive in Gatlinburg, TN last October. This entry was posted in Birds, Birdwatching, Christian, From The Past and tagged Birds Illustrated by Color Photography, Galliformes, Home School, Kids, Nature, Phasianidae, Photography, Turkey, Youth. Bookmark the permalink.